You can trade on the entire market using DJIA futures contracts. 1. When Are Dow Futures Posted Over the Weekend? The Dow Jones Industrial Average, or the Dow, is an index that tracks 30 major stocks listed on the New York Stock Exchange. 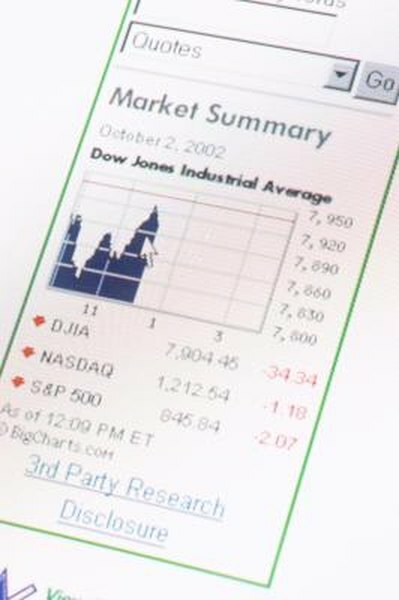 The Dow is sensitive to changes in economic and world events and can quickly rise or fall 100 points. Investors can take advantage of these price fluctuations by trading DJIA futures contracts. Open an online brokerage account that features Dow futures trading. Compare the commission rates and the minimum amount required to open an account. Make sure the firm is registered and in good standing with the Commodity Futures Trading Commission (CFTC). A broker will contact you shortly after you complete the online application. Discuss the different trading platforms the firm offers and open a demo account at the same time. Decide if you want to trade the e-mini Dow futures contract, the full-size contract or the Big Dow. The Big Dow requires an initial $13,750 margin deposit and $12,500 as the maintenance margin. One contract is worth 25 times the value of the DJIA, so if the Dow closes at 12,000, the contract is worth $300,000. Each tick is worth $25, making a 50 point move worth $1,250. Consider trading the full-size or e-mini contracts. The full-size initial margin deposit is $6,250 with a $5,000 maintenance margin. One contract is worth ten times the value of the DJIA, so if the Dow closes at 12,000, the contract is worth $120,000. One tick is worth $10, making a 50 point move worth $500. The e-mini initial margin deposit is $3,125 with a maintenance margin of $2,500. One e-mini contract is worth five times the value of the DJIA, so if the Dow closes at 12,000, the contract is worth $60,000. One tick equals $1.00, making a 50 point move worth $50. Download the demo account and practice trading. Watch the tutorials to learn how to use the trading platform and get tips on different trading strategies. Make use of your charting software to track the Dow using common indicators, including support and resistance levels and trend lines, which identify potential trade entry and exit points. Keep a [notebook](https://society6.com/notebooks?utm_source=SFGHG&utm_medium=referral&utm_campaign=2389) of each trade and make notes of your trading strategy and the trade outcome. Use your charts to find a good entry point. Start by trading one contract to protect your capital. Enter the trade and wait for conformation that your trade was filled. Monitor the trade daily and have an exit strategy in place to close the trade and take a profit or to limit a loss. Keep adequate funds in your account to avoid falling below the maintenance margin amount. Dow futures contracts are highly leveraged and one loss can wipe out your entire account. The CFTC suggests you only trade with money you can afford to lose.